Home Latest News Flight Safety Australia 2017 Collector’s Edition out now! The third annual printed edition of Flight Safety Australia is available now. 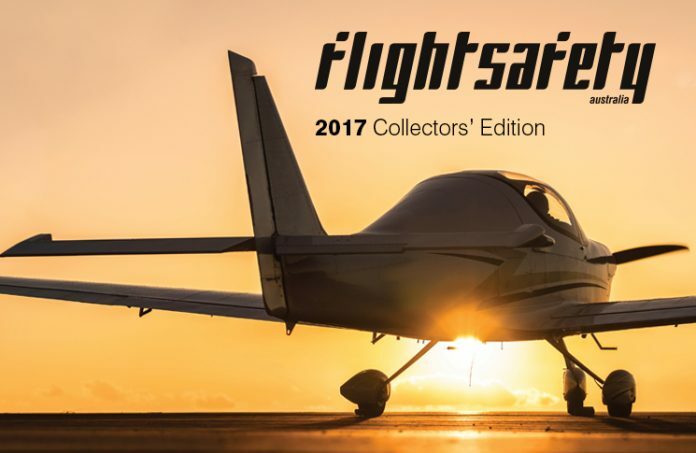 The 2017 Flight Safety Australia Collectors’ Edition is a bumper collection of more than 50 stories that were published in the online magazine during 2017. Featured topics include airshow safety, artificial intelligence, the development of electric aircraft, and a demolition of the pernicious myths surrounding the unhelpful notion of pilot error. There are also stories about wire strike, the characteristics of high-reliability organisations, the lessons still to be learned from Charles Lindbergh’s pioneering trans-Atlantic flight, and the most dangerous year by death toll in commercial air travel—1972. There are also stories on the qualities required for the position of chief engineer, and on the need for effective training of cabin crew. The close calls section is written by pilots who share their experiences in the name of safety. It covers incidents ranging from the terrifying to the merely troubling, in aircraft ranging from paragliders to sport aircraft, to general aviation types. This 168-page publication is packed with great reading for everyone involved in all sectors of Australian aviation. The 2017 Flight Safety Australia Collectors’ Edition costs just $15 for packing and postage and can be ordered through the CASA online store. Is the iPad app going to be updated? I agree with Richard; When is the iPad going to be updated? We are working on a replacement for the iPad app, (which will also be viewable on iOS and Android phones) and hope to have it available by 31 January.